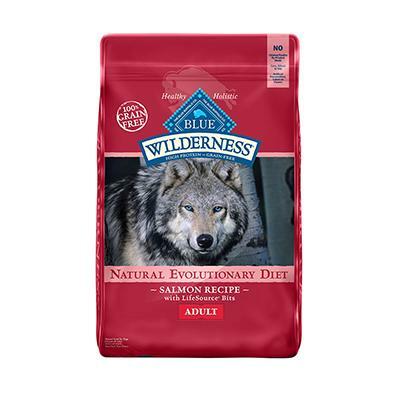 Deboned salmon, chicken meal and fish meal supply the protein your dog needs to support a healthy and active lifestyle. Sweet potatoes, peas and potatoes provide healthy complex carbohydrates for lasting endurance. LifeSource Bits contain a precise blend of vitamins, minerals and antioxidants selected by holistic veterinarians and animal nutritionists. These include ingredients that have been shown to help strengthen your dog's immune system, support their specific life stage requirements and protect them from the negative impact of environmental toxins. And, unlike other brands that add vitamins, minerals and antioxidants, LifeSource Bits are "cold-formed" to preserve their full potency. Deboned Salmon, Chicken Meal (source of Glucosamine), Tapioca Starch, Peas, Menhaden Fish Meal (source of Omega 3 Fatty Acids), Pea Protein, Tomato Pomace (source of Lycopene), Chicken Fat (preserved with Mixed Tocopherols), Flaxseed (source of Omega 3 and 6 Fatty Acids), Dried Egg, Natural Flavor, Potatoes, Alfalfa Meal, DL-Methionine, Potato Starch, Dried Chicory Root, Calcium Carbonate, Salt, Caramel, Choline Chloride, Sweet Potatoes, Carrots, Mixed Tocopherols (a natural preservative), Potassium Chloride, Dicalcium Phosphate, Vitamin E Supplement, Ferrous Sulfate, Iron Amino Acid Chelate, Zinc Amino Acid Chelate, Zinc Sulfate, Yucca Schidigera Extract, Oil of Rosemary, L-Lysine, Parsley, Kelp, Blueberries, Cranberries, Apples, Spinach, Blackberries, Pomegranate, Pumpkin, Barley Grass, Turmeric, L- Ascorbyl-2-Polyphosphate (source of Vitamin C), Copper Sulfate, Copper Amino Acid Chelate, Nicotinic Acid (Vitamin B3), Taurine, Calcium Pantothenate (Vitamin B5), Biotin (Vitamin B7), Manganese Sulfate, Vitamin A Supplement, Manganese Amino Acid Chelate, L-Carnitine, Thiamine Mononitrate (Vitamin B1), Riboflavin (Vitamin B2), Vitamin D3 Supplement, Vitamin B12 Supplement, Pyridoxine Hydrochloride (Vitamin B6), Beta Carotene, Dried Yeast, Dried Enterococcus faecium fermentation product, Dried Lactobacillus acidophilus fermentation product, Dried Aspergillus niger fermentation extract, Dried Trichoderma longibrachiatum fermentation extract, Dried Bacillus subtilis fermentation extract, Folic Acid (Vitamin B9), Calcium Iodate, Sodium Selenite.